In the land of the tribes of the Earth Mother there once existed a ring of stones called the Teeth of the Moon Sow. Many tales were told of it as a place of power and potency, but in the time before Slaine, none knew of its real magic. 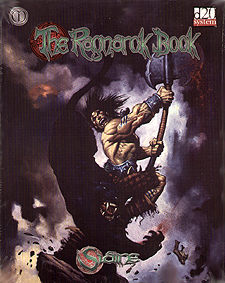 Welcome to The Rangarok Book, the third adventure in the Horned Lord and Moon Sow campaign for the Slaine roleplaying game. In this epic adventure, the heroes will deal with the consequences of civil war in their home tribe the Fir Domain, bring the tyrant Osdann to some form of justice at last, find two more of the magical Teeth of the Moon Sow, and quest for their lost tribal treasure, the Silver Sword of the Moon. The third part of the epic Horned Lord and Moon Sow campaign for Slaine: The Roleplaying Game of Celtic Heroes, the 128-page adventure The Ragnarok Book reveal new perils, new enemies and new goals in the quest to defeat the evil King Osdann, the hideous Drune Lords and the loathsome fomorians.